Overall, a good book about a factor in the rise of anti-Semitism. In this case the author argues that up to the Jewish War (AD 66-70) there was no inevitability about the subsequent anti-Semitism of Western civilization -- Rome and Jerusalem could accomodate each other. It was only when the newly installed Flavian dynasty had to legitimize itself that the Jewish War and the "differentness" of the Jews became a central tenet of Roman political ideology, which (combined with the Christians' need to divorce themselves from their Jewish cousins) grew into a vicious hatred of Jews. I think a weakness of the book is the suggestion that without the accident of Flavian politics, there would be no serious anti-Semitism. I'm willing to grant it as a factor but the "river" of anti-Semitism has many tributaries and I don't think Jewish-Christian relations would have been much better in its absence. 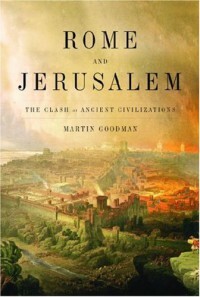 But that aside, Goodman argues persuasively that pre-War Roman-Jewish relations were generally good and that, absent the rise of Christianity, probably would have recovered eventually.